Hannah Ahluwalia, along with the Women in Business Students’ Association, Lear Corporation Career Services Center and Eli Broad College of Business, have come up with an idea to help fellow Michigan State students easily acquire professional attire. 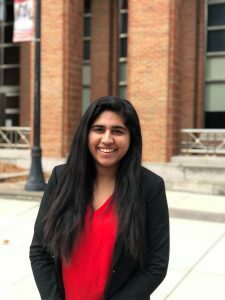 Ahluwalia, who is a senior accounting major, has decided to call her idea the Empowerment Closet where all MSU students, regardless of major, can come in and borrow professional clothes for events such as interviews, networking events and more. The need is there, said Marla McGraw, the director of career services at the Broad College. With plans still in motion, Ahluwalia explains when she hopes to have the closet up and running as the spring semester unfolds, and as she continues searching for a permanent location to base her operation. After much work put into the concept and organization of the Empowerment Closet, the next thing on the list is collecting the clothes for students to use. Ahluwalia and her partners have thought and reached out to many potential sources.